It’s that glorious time of year when the weather begins to warm up, the days start getting longer, and it feels so good to get outdoors. That means we need to be ready to protect our skin from increased exposure to ultraviolet rays. Many people don’t think about using sunscreen until it’s hot and sunny out, however the sun’s damaging rays are present all year round. Wearing sunscreen should be a daily habit, not just a seasonal one. We’d love to offer some helpful tips on how to best protect your skin and your health when it comes to sun exposure. 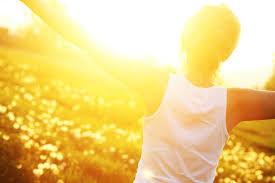 It’s worth mentioning that it is encouraged by many health professionals to get 15 minutes of direct sunlight on your skin before 10:00am or after 4:00pm to give your body a healthy dose of vitamin D. However, during the sun’s peak intensity UV rays can damage your skin quickly. Too much sun exposure can cause many problems in the skin, one of which is accelerated aging. The rays not only break down collagen and elastin, creating lines and wrinkles, but also cause increased pigmentation resulting in age spots on the skin. In fact, the sun’s rays may be responsible for as much as 80 percent of the skin’s visible signs of aging. Even more serious than that is the fact that too much sun exposure can cause skin cancer. With skin cancer being the most common form of cancer in the U.S., it is critical to protect your skin year round. Covering up with protective clothing, wearing a hat, limiting sun exposure between 10:00am and 4:00pm, and using sunscreen are a few ways to protect yourself from the sun and to keep your skin healthier. When choosing a sunscreen it’s important to keep in mind that your skin is your body’s largest organ, and anything you put on it affects your system as a whole. So we believe it’s a good idea to be aware of the ingredients that are in your sunscreen. One concerning ingredient commonly found in sunscreens is oxybenzone, a UV filter which can disrupt the hormone system. We recommend avoiding the use of sunscreens that contain this ingredient. In addition to finding a product that is safe for your skin, it is also important that it has broad spectrum protection, meaning it protects against both UVA and UVB rays. Long wave UVA rays are what age the skin and short wave UVB rays are what burn it. Both types of rays can be harmful and contribute to skin aging and the development of skin cancer. Wondering how much of an SPF you should use? SPF stands for sun protection factor. The SPF rating is calculated by comparing the amount of time needed to burn unprotected skin vs. sunscreen-protected skin. You should be using a broad spectrum SPF 15 or higher to protect not only against sunburn, but reduce the risk of skin cancer and premature skin aging caused by the sun. Below is a helpful chart that shows how much your protection goes up depending on what SPF you are using. The increase in protection between an SPF 30 and SPF 50 is only 2%, so a higher SPF isn’t necessarily better. In fact, using a high SPF can sometimes create a false sense of security, leading people to think they don’t need to reapply. The key to using sunscreen successfully is making sure you are following the directions on the bottle and are reapplying as directed. COOLA makes two different types of sunscreen, Classic and Mineral. They are differentiated by their active sun protection ingredients. Classic sunscreens use chemical (also commonly referred as “non-mineral” or “traditional”) active ingredients designed to absorb and dissipate UVA/UVB rays, while Mineral sunscreens use mineral (also commonly referred to as “physical”) active ingredients such as Titanium Dioxide and Zinc Oxide to scatter and reflect UVA/UVB rays. Since mineral actives are not absorbed into the skin and create a barrier reflecting the sun’s rays away from the skin, these formulas tend to be better for sensitive skin or for those wishing to avoid chemical based sunscreens. For more sun safety tips, please stop by our upcoming wellness event “Here Comes the Sun”, during Osterville’s O’Well Day on Saturday, May 5th. From 11:00am to 3:00pm we will be offering free samples, a raffle, light refreshments, and 15% off all suncare products! Emma Josselyn is the owner of Eden Skin Care and Make-Up, an upscale studio specializing in results-oriented facial treatments, meticulous waxing, beautiful, natural-looking make-up artistry, brow and lash tinting, and lash extensions. The knowledgeable and holistically minded estheticians will use only the highest quality clean beauty products. Eden is committed to bringing you outstanding service and providing you with healthy products that deliver results. You will also enjoy a professional and friendly atmosphere, as well as a peaceful experience to set your mind, body, and soul at ease.